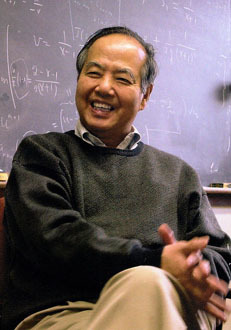 American physicist Tsung-Dao Lee studied the decay modes of the kaon (certain kinds of unstable mesons, also called K-mesons). Born in China, he was forcecd to drop out of high school by the circumstances of the Second Sino-Japanese War. He came to America as an undergraduate student and became an American citizen in 1962. At 29 years of age he became the youngest full professor at Columbia University in 1956, and the following year with his colleague Chen Ning Yang Lee conducted the work that marked his name in scientific history. The decay patterns of the kaon follow two very different patterns, and physicists believed these were two different kinds of kaon, called the tau-meson and theta-meson. Yang and Lee proposed that despite their divergent behaviors these were actually only a single kaon. They then created a series of experiments to test their idea, called the Lee-Yang prediction, and in independent tests at Columbia University and the National Bureau of Standards, their theory was proven. This violated the conservation of parity (space reflection symmetry of subatomic particles), and effectively overturned the Parity Law in Nuclear Physics, which had been accepted nearly universally for decades. In 1957, Lee and Yang were awarded the Nobel Prize for Physics. 31 years old when he received the honor, Lee was and remains the youngest American Nobel laureate. He has since conducted research into astrophysics, hydrodynamics, the neutrino, quantum chromodynamics, solid state physics, statistical mechanics, turbulence, and the implications of the Lee-Yang prediction. He is also known for the Lee Model of quantum field theory. Officially retired since 2003, he continues his research and enjoys reading detective novels.